Turquoise was mistakenly named as such (‘Turquoise’ means Turkey) because the Europeans of the 16th century thought that Turkey was where this lovely blue-green stone came from. However, it only passed through Turkey on its way from Iran. 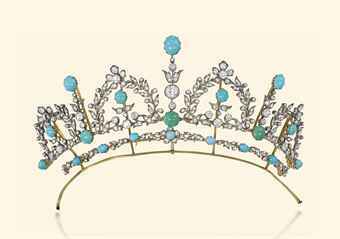 Turquoise was particularly prized during the Victorian era. The sky blue variety was especially valued and it was considered a perfect stone for women of all ages, but especially younger women. 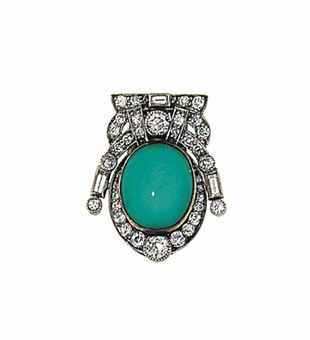 Turquoise was valued more highly than we value it today and therefore it was usually set with gold and often other precious materials, including diamonds. The Georgians also loved it and tended to mix it with other gems, such as pearls. 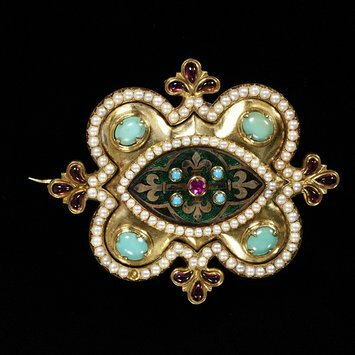 However, the use of turquoise was really at its height from the mid 1800s through to the early part of the 1900s, particularly in connection with Egyptian revival. It was nearly always cabochon cut; occasionally it was carved, faceted or worn as nuggets. The bright blue colour reminded Victorians of forget-me-nots, which signified true love in the language of flowers. Turquoise was a particularly popular gift for bridesmaids, often in the form of doves. In 1840, Queen Victoria gave her twelve bridesmaids turquoise brooches in the shape of eagles (This is according to the V&A Museum, although I have also seen reports that she in fact gave them portraits of herself framed in turquoise). 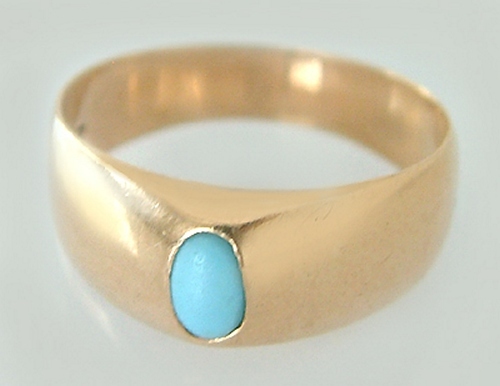 Turquoise was traditionally believed to ward off danger. Nowadays, turquoise is nearly always set in silver rather than gold. 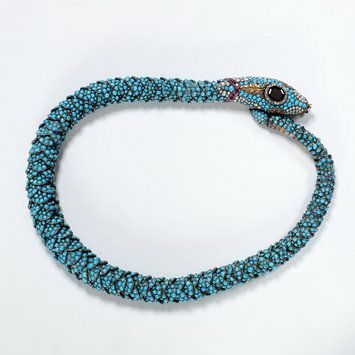 The kind of turquoise we see today that is webbed with matrix and that we associate with the American South-West was never used in previous eras in Europe; rather you only see pieces used with completely flawless, smooth color. Turquoise is highly porous and today is treated to avoid the absorption of oils and other materials. However, in the Victorian era it was never treated and therefore it is not unusual to see pieces which have changed color throughout the same piece, some stones remaining a sky blue, whilst others have turned a deeper green. To me, this natural variation that comes with time adds character and depth to a piece and is superior to today’s more sterile and bland interpretation of the stone. There are also nowadays a number of synthetic and imitation turquoises around which further give turquoise the reputation for being less than the beautiful and precious material it truly is. It is important to note that many antique pieces appear to contain turquoise, but on closer inspection turn out to actually have turquoise colored glass. Amazonite can also be a stone mistaken for turquoise (on close inspection Amazonite shows a mottling of the surface not seen in turquoise). A gemologist can tell if it is synthetic turquoise or not using magnification; this is not generally a concern in antique pieces, however, as the first truly synthetic turquoise was not created until the 1970s, although there have always been turquoise imitations. 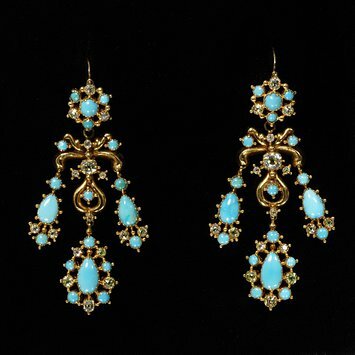 Gold and turqoise earrings, England circa 1830.